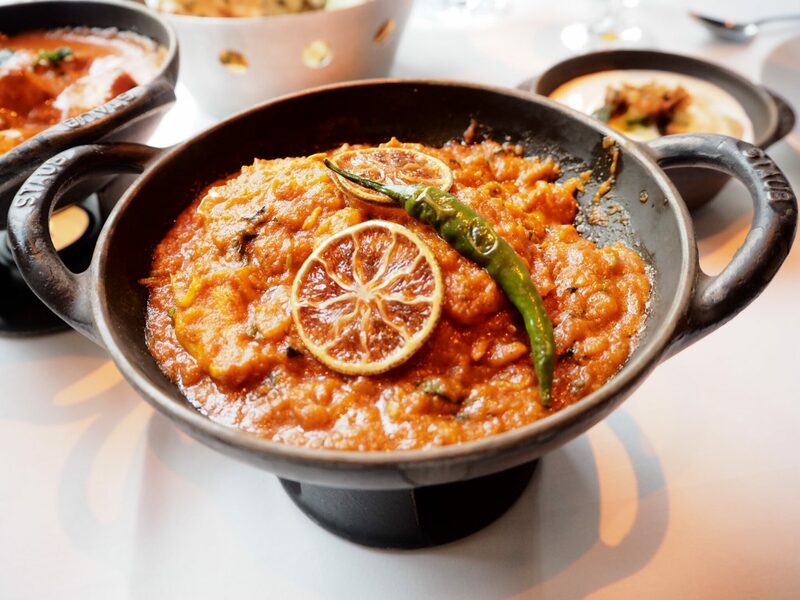 One of London’s oldest Indian restaurants, dating back from 1926, Veeraswamy has been a high-end Indian restaurant that has been on my list to try for a long time. The perfect opportunity arose when my brother suggested it as an option for a celebratory lunch for the 1 year anniversary of my blog. Nestled within the hustle and bustle of Regent street, we took the lift up to the restaurant, full of charm and grandeur . 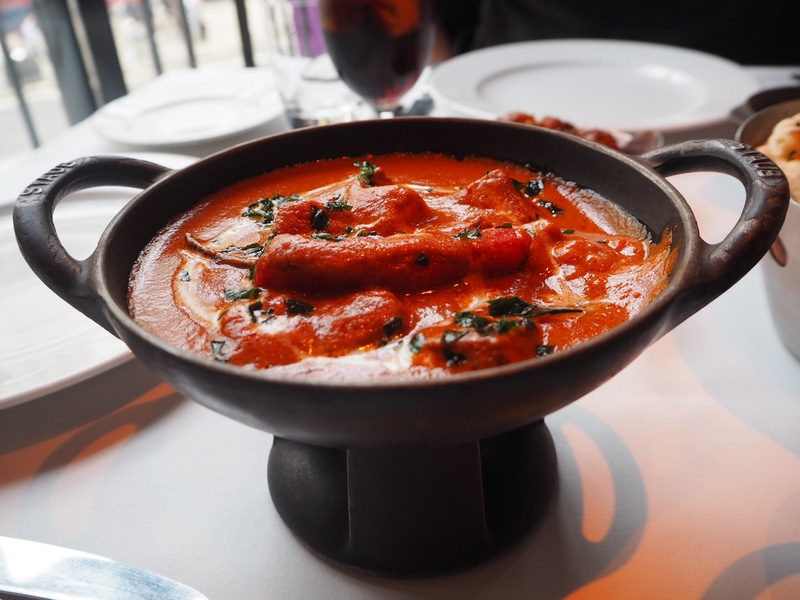 It has a mix of modern with Indian heritage fused together in terms of its decor, and I especially liked the menus, which has some of the original prints from its early years on it. I love history so it was lovely to see what price and the advertising back in the day was like from the illustrations on their extensive menu. The menu is slightly different to your average curry house and really interesting. To start with we went for the Raj Kachori which was amazing. My brother recommended this dish and it did not disappoint at all. It had beautiful fresh flavours and the portions were really generous. It always pays to go with a large group of people as you can try so many things and our next choice was Angara Chicken Tikka, which came beautifully presented on a banana leaf. Chana bhatura was next and the bhaturas were so nice and fluffy and the chana was very tasty. In fact this was probably my favourite out of the starters. Mains arrived next and our vegetarian option was Paneer Mirchi Makhani. This was divine. On the side we had cucumber raita. If anyone knows my husband well then they know he has a real affinity for raita and it has to accompany all his Indian meals and by his standards this was really good. The non-vegetarian option was Chicken Nimboo Dopiaza, which had a wonderful flavour, a little bit of heat and tasted very refreshing. To accompany our meal we had a speciality bread basket, which had the chef’s choice of 3 breads of the day. Then there was a lovely gesture from Veeraswamy where they brought this celebration dessert out for me. It was so sweet of them and added to the exceptional service we experienced throughout our meal. This didn’t deter me from hogging my own dessert too and I went for the caramelised banana kulfi which was definitely a showstopper and something I have craved since and would definitely go back for. I thoroughly enjoyed my meal at Veeraswamy and is definitely a restaurant I will visit again. It is perfect for Sunday lunch, a special occasion or just a lovely meal when you want something decadent and worth it. This looks like quite the sumptuous feast!